The Dragon School is one school on two sites in Oxford, England. The Prep School and Dragon Pre-Prep are both co-educational schools. The Dragon Prep School was founded in 1877 as the Oxford Preparatory School. It takes day pupils and boarders. Stagecoach Theatre Arts Ltd is a professional part-time theatre arts School with over 600 schools in the United Kingdom. Training is offered in singing, dancing and acting. Watson continued to work outside of the Harry Potter films, appearing in the 2007 television adaptation of the novel Ballet Shoes and lending her voice to The Tale of Despereaux (2008). Following the last Harry Potter film, she took on starring and supporting roles in My Week with Marilyn (2011), The Perks of Being a Wallflower (2012) and The Bling Ring (2013), made an appearance as an exaggerated version of herself in This Is the End (2013),  and portrayed the title character's adopted daughter in Noah (2014). In 2017, she starred as Belle in a live-action adaptation of the musical romantic fantasy film Beauty and the Beast . Her other roles include Regression (2015), Colonia (2015) and The Circle (2017). Ballet Shoes is a 2007 British television film, adapted by Heidi Thomas from Noel Streatfeild's 1936 novel Ballet Shoes. It was produced by Granada Productions and premiered on BBC One on 26 December 2007. It is directed by Sandra Goldbacher. Ballet Shoes: A Story of Three Children on the Stage is a children's novel by Noel Streatfeild, published by Dent in 1936. It was her first book for children, and was illustrated by the author's sister, Ruth Gervis. The Tale of Despereaux is a 2008 British-American computer-animated adventure fantasy family film directed by Sam Fell and Robert Stevenhagen and produced by Gary Ross and Allison Thomas. Loosely based on the 2003 book of the same name by Kate DiCamillo, the movie is narrated by Sigourney Weaver and stars Matthew Broderick, Robbie Coltrane, Frances Conroy, Tony Hale, Ciarán Hinds, Dustin Hoffman, Richard Jenkins, Kevin Kline, Frank Langella, William H. Macy, Charles Shaughnessy, Stanley Tucci, Tracey Ullman, and Emma Watson. Worcester College is one of the constituent colleges of the University of Oxford in England. The college was founded in 1714 by the benefaction of Sir Thomas Cookes, a Worcestershire baronet, with the college gaining its name from the county of Worcestershire. Its predecessor, Gloucester College, had been an institution of learning on the same site since the late 13th century until the Dissolution of the Monasteries in 1539. Founded as a men's college, Worcester has been coeducational since 1979. Maisons-Laffitte is a commune in the Yvelines department in the Île-de-France region in north-central France. It is located in the north-western suburbs of Paris 18.2 km (11.3 mi) from the center. Headington School is an independent girls' school in Headington, Oxford, England, founded by a group of evangelical Christians in 1915. The Good Schools Guide called Headington "A delightful school, [which] nurtures and entertains its pupils while at the same time achieving excellent academic results... fun and stimulating to be at." The A Level is a subject-based qualification conferred as part of the General Certificate of Education, as well as a school leaving qualification offered by the educational bodies in the United Kingdom and the educational authorities of British Crown dependencies to students completing secondary or pre-university education. A number of countries, including Singapore, Kenya, Mauritius and Zimbabwe have developed qualifications with the same name as and a similar format to the British A Levels. Obtaining an A Level, or equivalent qualifications, is generally required for university entrance, with universities granting offers based on grades achieved. Watson's filming for the final instalment, Harry Potter and the Deathly Hallows, began on 18 February 2009  and ended on 12 June 2010. For financial and scripting reasons, the original book was divided into two films which were shot consecutively. Harry Potter and the Deathly Hallows – Part 1 was released in November 2010 while the second film was released in July 2011. Harry Potter and the Deathly Hallows – Part 2 became a commercial and critical success. The highest-grossing film in the franchise, it grossed more than $1.3 billion worldwide and proved to be Watson's most commercially successful film yet. Joanne Rowling, , writing under the pen names J. K. Rowling and Robert Galbraith, is a British novelist, philanthropist, film producer, television producer and screenwriter, best known for writing the Harry Potter fantasy series. The books have won multiple awards, and sold more than 500 million copies, becoming the best-selling book series in history. They have also been the basis for a film series, over which Rowling had overall approval on the scripts and was a producer on the final films in the series. 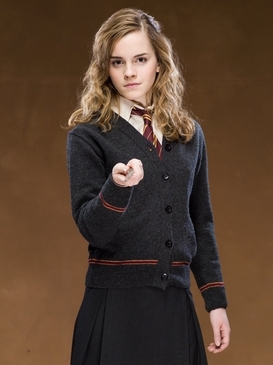 Hermione Jean Granger ( ) is a fictional character in J. K. Rowling's Harry Potter series. She first appears in Harry Potter and the Philosopher's Stone, as a new student on her way to Hogwarts. After Harry and Ron save her from a mountain troll in the girls' restroom, she becomes best friends with them and often uses her quick wit, deft recall, and encyclopaedic knowledge to help them in really bad situations. J.K Rowling has stated that Hermione resembles herself as a young girl, with her insecurity and fear of failure. Daniel Jacob Radcliffe is an English actor and producer. He is known for playing the titular protagonist in the Harry Potter film series, based on the novels by J. K. Rowling. Emily Margaret Watson is an English actress. She was nominated for the Academy Award for Best Actress for her debut film role as Bess McNeil in Lars von Trier's Breaking the Waves (1996) and for her role as Jacqueline du Pré in Hilary and Jackie (1998), winning the BIFA Award for Best Actress for the latter. She won the BAFTA TV Award for Best Actress for playing Janet Leach in the 2011 ITV television biopic Appropriate Adult. Emma Rose Roberts is an American actress and singer. After making her film debut as Kristina Jung in the crime film Blow (2001), Roberts gained recognition for her lead role as Addie Singer on the Nickelodeon television series Unfabulous (2004–07). She released her debut studio album Unfabulous and More in 2005. Roberts then appeared in numerous films, including Aquamarine (2006), Nancy Drew (2007), Wild Child (2008), Hotel for Dogs (2009), Valentine's Day (2010), It's Kind of a Funny Story (2010), and The Art of Getting By (2011). Helen Elizabeth McCrory is a British actress. Saoirse Una Ronan is an Irish and American actress. She is the recipient of several accolades, including a Golden Globe Award, and has been nominated for three Academy Awards and four British Academy Film Awards. Alison Sudol is an American singer, songwriter, actress, and music video director. She is known as the singer A Fine Frenzy, and also for her role as Queenie Goldstein in the Fantastic Beasts films Fantastic Beasts and Where to Find Them (2016) and Fantastic Beasts: The Crimes of Grindelwald (2018). Her music has been featured on numerous television shows and in several major motion pictures. Production ofHarry Potter and the Deathly Hallows, the 2010/2011 two-film finale of the Harry Potter film series, began in 2009. Both Part 1 and Part 2 were directed by David Yates, written by Steve Kloves, and form the screen adaptation of the novel of the same name by J. K. Rowling. 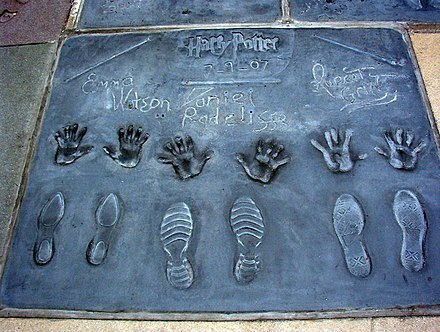 The picture was produced by Rowling, alongside David Heyman and David Barron. It was originally set to be released as one, but due to its long running time, Warner Bros. Pictures divided the film into two parts. The Wizarding World is a fantasy media franchise and shared fictional universe centred on a series of films, based on the Harry Potter novels by British author J. K. Rowling. The films have been in production since 2000, and in that time ten films have been produced—eight are adaptations of the Harry Potter novels and two are part of the Fantastic Beasts series. The films are owned and distributed by Warner Bros. Pictures, and three more are in various stages of production. The series has collectively grossed over $9.1 billion at the global box office, making it the third-highest-grossing film franchise of all-time. 1 2 Walker, Tim (29 September 2012). "Emma Watson: Is there Life After Hermione?". The Independent . Archived from the original on 30 September 2012. Retrieved 12 January 2008. 1 2 3 4 5 6 "Life & Emma". Emma Watson official website. Archived from the original on 21 April 2010. Retrieved 16 April 2010. ↑ "Check If You're a British Citizen". United Kingdoms Government. UK Government Digital Service. Archived from the original on 31 May 2014. Retrieved 23 April 2014. (If you were born on or after 1 January 1983 and before 1 January 2006 to parents married and British 'not by descent') in most cases you'll be a British citizen 'by descent'. ↑ "Daniel Radcliffe, Rupert Grint and Emma Watson to Reprise Roles in the Final Two Instalments of Warner Bros. Pictures' Harry Potter Film Franchise" (Press release). Warner Bros. 23 March 2007. Archived from the original on 2 April 2007. Retrieved 23 March 2007. 1 2 Sager, Rebekah (21 March 2017). "Beauty and the Beast breaks records: Is Emma Watson now Hollywood's most sought after actress?". The Hollywood Reporter. Archived from the original on 26 April 2017. Retrieved 3 April 2017. 1 2 Puig, Claudia (11 June 2013). "This Is the End – and It's Hilarious". USA Today . Archived from the original on 5 October 2015. Retrieved 18 November 2014. 1 2 "Emma Watson Gets Biblical With Darren Aronofsky's 'Noah'". indiewire.com. 7 June 2012. Archived from the original on 16 June 2012. Retrieved 24 July 2012. 1 2 "Emma Watson Graduates from Brown University". The Telegraph (UK). 25 May 2014. Archived from the original on 26 May 2014. Retrieved 25 May 2014. 1 2 "Go Behind the Scenes with Emma Watson on the Burberry Shoot". Vogue News. June 2009. Archived from the original on 3 September 2014. Retrieved 22 June 2014. 1 2 Oliver, Dana (14 March 2011). "Emma Watson Named New Face of Lancome". The Huffington Post. Archived from the original on 4 September 2011. Retrieved 2 September 2011. 1 2 3 Holmes, Rachael (17 September 2009). "Emma Watson launches ethical fashion range with People Tree". The Guardian. UK. Archived from the original on 21 August 2013. Retrieved 17 April 2010. 1 2 King, Susan (31 October 2014). "At BAFTA Event, Emma Watson Dedicates Award to Her Long Dead Hamster". Los Angeles Times. Archived from the original on 31 October 2014. Retrieved 31 October 2014. 1 2 "Emma Watson named UN Women Goodwill Ambassador". The Independent. 8 July 2014. Archived from the original on 9 July 2014. ↑ Barlow, Helen. "A life after Harry Potter". The Sydney Morning Herald. Archived from the original on 3 July 2007. Retrieved 16 March 2006. ↑ Self, Will (17 August 2012). "Emma Watson, The Graduate". The New York Times. Archived from the original on 26 January 2017. ↑ "Q&A with Emma Watson – The Hour Publishing Company: Entertainment News". Thehour.com. 18 December 2008. Archived from the original on 3 September 2014. Retrieved 26 February 2014. 1 2 Watson, Emma. "Emma". Emma Watson's Official Website. Archived from the original on 2 August 2007. Retrieved 3 August 2007. ↑ Reece, Damian (4 November 2001). "Harry Potter drama school to float". The Daily Telegraph. UK. Archived from the original on 16 October 2010. Retrieved 8 March 2010. ↑ Watson, Emma. "Emma & Screen". Official Website. Archived from the original on 7 May 2010. Retrieved 16 April 2010. ↑ Muir, Kate (15 May 2004). "Cast Interviews". The Times. UK. Archived from the original on 11 February 2007. Retrieved 12 January 2008. ↑ "Pupils 'sitting too many GCSEs'". BBC News. 24 August 2006. Archived from the original on 18 June 2007. Retrieved 27 May 2007. ↑ "A-Level results of the stars: Emma Watson, Benedict Cumberbatch, Matt Smith, Jenna Coleman – and the Doctor..." Radio Times . 17 August 2017. Retrieved 25 January 2019. ↑ Tibbetts, Graham (14 August 2008). "A-levels: Harry Potter actress Emma Watson gets straight As". The Daily Telegraph. UK. Retrieved 10 December 2008. 1 2 Olly Richards (14 March 2008). "Potter Producer Talks Deathly Hallows". Empire. Archived from the original on 10 July 2011. Retrieved 14 March 2008. 1 2 Long, Camilla (7 December 2008). "What next in life for Emma Watson". The Times. UK. Archived from the original on 15 June 2011. Retrieved 10 December 2008. ↑ Ford, James (14 July 2009). "Catching up with Emma Watson". Paste . Archived from the original on 16 July 2009. Retrieved 15 July 2009. ↑ "Message from Emma". Emma Watson Official. 7 March 2011. Archived from the original on 8 March 2011. Retrieved 15 September 2013. ↑ "Harry Potter Star Emma Watson begins her year at Oxford University!". Oxford Royale Academy. 21 October 2011. Archived from the original on 3 October 2012. Retrieved 8 July 2013. ↑ "Interview". Ellen (video posted to official YouTube channel). 24 March 2014. Event occurs at 02:12–02:58. Syndicated. Archived from the original on 2 May 2014. Retrieved 3 May 2014. ↑ Adams, Char (7 August 2015). "Emma Watson Reveals She Took a Weeklong Vow of Silence After 'Horrendous' Split from Matt Janney". People . Archived from the original on 9 August 2015. Retrieved 9 August 2015. ↑ Watson, Emma [@EmWatson] (9 October 2015). "The week long meditation ..." (Tweet). Retrieved 9 October 2015– via Twitter. ↑ "Why Emma Watson Became a Certified Yoga Instructor". ABC News. Archived from the original on 7 April 2014. Retrieved 4 April 2014. ↑ "Harry Potter magically shatters records". Hollywood.com. 18 November 2001. Archived from the original on 2 October 2007. Retrieved 21 September 2007. ↑ "2001 Worldwide Grosses". Box Office Mojo. Archived from the original on 10 April 2007. Retrieved 29 May 2007. ↑ Hiscock, John (4 November 2007). "Magic is the only word for it". The Daily Telegraph. UK. Archived from the original on 1 June 2008. Retrieved 23 September 2007. ↑ Linder, Brian (17 November 2001). "Review of Harry Potter and the Sorcerer's Stone". IGN. Archived from the original on 29 December 2007. Retrieved 23 September 2007. 1 2 "2002 nominations and winners". Young Artist's Awards. Archived from the original on 5 September 2014. Retrieved 13 September 2007. ↑ Kenneth Turan (15 November 2002). "Harry Potter and the Chamber of Secrets". Los Angeles Times. Archived from the original on 28 December 2005. Retrieved 22 September 2007. ↑ Ellen, Barbara (14 November 2002). "Film of the week". The Times. UK. Archived from the original on 17 May 2011. Retrieved 23 September 2007. ↑ "Bravo Otto – Sieger 2003". Bravo magazine (in German). Archived from the original on 11 October 2007. Retrieved 22 September 2007. ↑ Trout, Jonathon (1 June 2004). "Daniel Radcliffe, Rupert Grint, Emma Watson". BBC. Archived from the original on 18 July 2007. Retrieved 3 August 2007. ↑ A. O. Scott (3 June 2004). 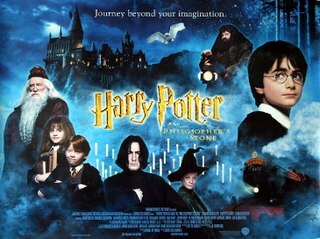 "Harry Potter and the Prisoner of Azkaban: Film review". The New York Times. Archived from the original on 18 February 2012. Retrieved 23 September 2007. ↑ "Dan Wins Another Otto Award". DanRadcliffe.com. Archived from the original on 11 October 2007. Retrieved 13 September 2007. ↑ "Bravo Otto Awards 2005" (Press release) (in German). Presseportal.com. Archived from the original on 11 October 2007. Retrieved 13 September 2007. ↑ "Daniel Radcliffe, Emma Watson and Rupert Grint". IGN. 15 November 2005. Archived from the original on 7 November 2007. Retrieved 3 August 2007. ↑ "Goblet of Fire awards". Broadcast Film Critics Association. Archived from the original on 29 December 2007. Retrieved 13 September 2007. 1 2 Carroll, Larry (24 April 2006). "Alba, Carell, 'Crashers,' 'Virgin' Big Nominees For MTV Movie Awards". MTV. Archived from the original on 19 December 2007. Retrieved 22 September 2007. ↑ Horn, Steven (26 June 2007). "Interview with Emma Watson". IGN. Archived from the original on 7 November 2007. Retrieved 30 September 2007. ↑ Waterman, Lauren. "emma enchanted". Teen Vogue. Archived from the original on 5 January 2010. Retrieved 12 October 2009. ↑ "New Harry Potter scene for queen". BBC News. 12 June 2006. Archived from the original on 21 September 2007. Retrieved 6 August 2007. ↑ "All Time worldwide opening records". Box Office Mojo. Archived from the original on 23 June 2011. Retrieved 25 September 2007. ↑ Pryor, Fiona (28 September 2007). "Potter wins film awards hat-trick". BBC News. Archived from the original on 16 October 2007. Retrieved 29 September 2007. ↑ Howell, Peter (11 January 2008). "Stardom fades, but cement lives on". Toronto Star. Archived from the original on 21 May 2008. Retrieved 22 January 2008. ↑ Peck, Sally (10 July 2007). "Harry Potter's Sidekick 'Rich Enough To Retire'". The Telegraph . London. Archived from the original on 31 March 2014. Retrieved 25 February 2014. ↑ Burman, John (10 March 2009). "In Pictures: Hollywood's Most Valuable Young Stars". Forbes. Archived from the original on 15 April 2009. Retrieved 18 April 2009. ↑ "Harry Potter star Emma Watson is top-earning actress". BBC News. 5 February 2010. Archived from the original on 16 May 2014. Retrieved 5 February 2010. 1 2 "Harry Potter Will Be Played By Daniel Radcliffe in Final Two Flicks". MTV. 2 March 2007. Archived from the original on 10 May 2009. Retrieved 18 April 2009. ↑ "Will Harry Potter lose one of its stars?". Newsweek. 2 October 2006. Archived from the original on 5 October 2006. Retrieved 25 September 2007. ↑ "Hermione is back". news.com.au. 25 March 2007. Archived from the original on 11 May 2009. Retrieved 12 April 2009. ↑ Edidin, Peter (24 March 2007). "Gang's all here". The New York Times. Archived from the original on 3 September 2014. Retrieved 12 April 2009. ↑ Warman, Matt (21 December 2007). "Dancing towards their dreams". The Daily Telegraph. UK. Archived from the original on 24 January 2008. Retrieved 12 January 2008. ↑ Pielou, Adriaane (26 December 2007). "Ballet Shoes saw me through". The Daily Telegraph. UK. Archived from the original on 23 May 2008. Retrieved 1 January 2008. ↑ "A Christmas treat for all the family" (Press release). BBC. Archived from the original on 30 November 2007. Retrieved 1 January 2008. ↑ "BBC One Transmission Details, weeks 52/1" (Press release). BBC. Archived from the original on 9 December 2007. Retrieved 1 January 2008. ↑ Tryhorn, Chris (27 December 2007). "Viewers sold on Old Curiosity Shop". The Guardian. UK. Archived from the original on 21 August 2013. Retrieved 1 January 2008. ↑ Teeman, Tim (27 December 2007). "Last Night's TV". The Times. UK. Archived from the original on 17 May 2011. Retrieved 1 January 2008. ↑ Watson, Emma. "Filmography". Official website. Archived from the original on 10 May 2010. Retrieved 16 April 2010. ↑ "The Tale of Despereaux". Box Office Mojo. Archived from the original on 5 February 2010. Retrieved 16 April 2010. ↑ Watson, Emma (28 November 2007). "Ballet Shoes interviews". Emma Watson's official website news. Archived from the original on 14 April 2009. Retrieved 12 April 2009. ↑ Watson, Emma (22 May 2008). "Ballet Shoes interviews". Emma Watson's official website news. Archived from the original on 14 April 2009. Retrieved 12 April 2009. ↑ "Harry Potter and the Half-Blood Prince Global Release Dates". Warner Bros. Pictures. Archived from the original on 16 August 2010. Retrieved 14 August 2010. ↑ "Potter film release date delayed". BBC News. 15 August 2008. Archived from the original on 18 February 2009. Retrieved 28 July 2009. ↑ Turan, Kenneth (14 July 2009). "Review: 'Harry Potter and the Half-Blood Prince'". Los Angeles Times. Archived from the original on 18 July 2009. Retrieved 28 July 2009. ↑ Kois, Dan (14 July 2009). "Critic Review for Harry Potter and the Half-Blood Prince". The Washington Post. Archived from the original on 16 February 2011. Retrieved 28 July 2009. ↑ Sandhu, Sukhdev (16 July 2009). "Harry Potter and the Half-Blood Prince, review". The Daily Telegraph. UK. Archived from the original on 2 December 2014. ↑ Watson, Emma (17 February 2009). "Filming begins". Emma Watson's official website news. Archived from the original on 14 April 2009. Retrieved 12 April 2009. ↑ Schwartz, Alison (14 June 2010). "Daniel Radcliffe Calls Wrapping Up Harry Potter Devastating". People . Archived from the original on 8 February 2011. Retrieved 9 February 2011. ↑ Ebert, Roger (13 July 2011). "Harry Potter and the Deathly Hallows: Part 2". Chicago Sun-Times . Retrieved 15 November 2018. ↑ "Say You Don't Want It". Archived from the original on 18 August 2010. ↑ "Emma in My Week With Marilyn". emma-watson.net. 8 October 2010. Archived from the original on 28 October 2010. Retrieved 3 November 2010. ↑ "Emma Watson Joins My Week with Marilyn". movieweb.net. 24 September 2010. Archived from the original on 29 September 2010. Retrieved 23 December 2010. ↑ McNary, Dave (19 May 2010). "Watson, Lerman in talks for 'Perks'". Variety. Retrieved 16 July 2010. ↑ Mark Olsen (1 November 2012). "'The Perks of Being a Wallflower' steadily blossoms". Los Angeles Times. ↑ Lombardi, Ken (29 May 2013). "This Is the End: Emma Watson Takes on the Boys in a New Red-Band TV Spot". CBS News. Archived from the original on 29 November 2014. Retrieved 18 November 2014. ↑ Inside Look: This Is the End with Seth Rogen and Emma Watson. YouTube (Movieline official). 11 June 2013. Archived from the original on 6 December 2015. Retrieved 18 November 2014. ↑ Kroll, Justin (20 February 2017). "Cinderella's Glass Slipper Doesn't Fit Emma Watson". Variety. Archived from the original on 4 March 2013. Retrieved 28 February 2013. ↑ Graser, Marc (29 January 2015). "Cinderella's Glass Slipper Doesn't Fit Emma Watson". Variety. Archived from the original on 14 March 2013. Retrieved 12 March 2013. ↑ GugLiemli, Jodi (18 January 2017). "Beauty and the Beast's Emma Watson Reveals She Was Once Offered the Part of Cinderella for 2015 Live-Action Film". People. Archived from the original on 20 February 2017. Retrieved 20 February 2017. ↑ Alexandra Cheney, “’Downton Abbey’ Star is New Cinderella,” The Wall Street Journal , 30 April 2013. ↑ "Woman of the Year: Emma Watson". 15 October 2013. Archived from the original on 7 September 2013. ↑ "Emma Watson and Cumberbatch Top 'Sexiest' Stars List". BBC. 2 November 2013. Archived from the original on 5 October 2013. Retrieved 18 November 2014. ↑ "Emma Watson, Daniel Bruhl to Star in Thriller 'Colonia'". Variety. 29 September 2014. Archived from the original on 24 December 2014. Retrieved 11 January 2015. ↑ "Emma Watson starring with Ethan Hawke for New Thriller Movie". Archived from the original on 6 February 2014. ↑ Earp, Catherine (5 February 2014). "Emma Watson joins Ethan Hawke film Regression". Digital Spy. Archived from the original on 19 April 2014. Retrieved 19 May 2014. ↑ "Colonia (2016)". Rotten Tomatoes. Archived from the original on 6 March 2017. Retrieved 5 March 2017. ↑ "Regression (2016)". Rotten Tomatoes. Archived from the original on 6 February 2017. Retrieved 5 March 2017. ↑ "The Vicar of Dibley – Comic Relief Special: The Bishop of Dibley". British Comedy Guide . Archived from the original on 9 April 2015. Retrieved 22 April 2015. ↑ Hooks, Bell (18 February 2016). "In Conversation with Bell Hooks and Emma Watson". PAPER . Archived from the original on 20 February 2016. Retrieved 21 February 2016. ↑ Kit, Borys (4 March 2015). "Disney's Beauty and the Beast Casting Dan Stevens as the Beast". The Hollywood Reporter . Archived from the original on 5 March 2015. Retrieved 5 March 2015. ↑ "Emma Watson to star in The Circle opposite Tom Hanks". Entertainment Weekly's EW.com. Archived from the original on 26 June 2015. ↑ Spencer Perry (24 August 2018). "Emma Watson Replacing Emma Stone in Sony's Little Women Movie". Comingsoon.net. Retrieved 24 August 2018. ↑ Neate, Rupert (19 June 2008). "Chanel: 'No contract' for Harry Potter's Emma Watson". The Daily Telegraph. UK. Archived from the original on 11 May 2009. Retrieved 18 April 2009. ↑ Craik, Laura (9 June 2009). "Harry Potter star Emma Watson charms Burberry". London Evening Standard. London. Archived from the original on 12 June 2009. Retrieved 28 June 2009. ↑ Alexander, Hilary (5 January 2010). "Emma Watson is Burberry's spring/summer 2010 poster girl". The Daily Telegraph. UK. Archived from the original on 9 February 2010. Retrieved 17 April 2010. ↑ Foster, Alistair (15 February 2011). "Elle style icon? I have no idea who you are, Emma Watson". London Evening Standard . Archived from the original on 11 March 2011. Retrieved 29 November 2011. 1 2 "People Tree". Official website. Archived from the original on 25 April 2010. Retrieved 17 April 2010. ↑ "People Tree collaborates with Emma Watson". Peopletreeyouth.co.uk. Archived from the original on 8 February 2010. Retrieved 8 March 2010. 1 2 3 Olins, Alice (13 January 2010). "Emma Watson burnishes her ethical fashion credentials". The Times. UK. Archived from the original on 15 June 2011. Retrieved 17 April 2010. ↑ Milligan, Lauren (1 February 2010). "Ethical Emma". Teen Vogue. Archived from the original on 16 March 2010. Retrieved 17 April 2010. ↑ Alexander, Hilary (29 January 2010). "Emma Watson models her range for People Tree". The Daily Telegraph. UK. Archived from the original on 4 February 2010. Retrieved 17 April 2010. ↑ "News". Archived from the original on 23 July 2011. Retrieved 2 September 2010. 1 2 Sowray, Bibby (1 December 2014). "Emma Watson Wins Award for Best British Style at Fashion Awards". Telegraph Media Group. Archived from the original on 13 December 2014. Retrieved 2 December 2014. ↑ "Emma Watson announces UN Women Goodwill Ambassador role". United Kingdom: BBC Newsbeat. 8 July 2014. Archived from the original on 23 September 2014. Retrieved 21 September 2014. ↑ Bennetts, Leslie (3 November 2010). "Emma Watson Interview". Marie Claire. Archived from the original on 6 October 2014. Retrieved 24 September 2014. ↑ Emma Watson at the HeForShe Campaign 2014 – Official UN Video. YouTube. 22 September 2014. Event occurs at 2:52–2:57. Archived from the original on 5 February 2017. Retrieved 26 February 2016. ↑ Robinson, Joanna (8 March 2015). "Emma Watson on How Being Threatened for Speaking About Feminism Enraged and Motivated Her". Vanity Fair . Archived from the original on 9 March 2015. Retrieved 9 March 2015. When they saw that the minute I stepped up and talked about women's rights I was immediately threatened. I mean within less than 12 hours I was receiving threats. ... It's funny, people were like, 'Oh she's going to be so disheartened by this.' ... I was just raging. It made me so angry that I was just like, 'This is why I have to be doing this. If they were trying to put me off, it did the opposite'. ↑ "Malala tells Emma Watson she identifies as a feminist, thanks to her". Women in the World. 5 October 2015. Archived from the original on 7 November 2015. Retrieved 6 October 2015. ↑ "In Uruguay, UN Women Goodwill Ambassador Emma Watson Urges Women's Political Participation". United Nations. 18 September 2014. Archived from the original on 21 September 2014. Retrieved 21 September 2014. ↑ Locker, Melissa (21 December 2014). "The Feminist Celebrity of the Year Is ... Emma Watson". Vanity Fair. Archived from the original on 9 March 2017. Retrieved 19 December 2014. ↑ "Emma Watson Davos Equality Speech". Business Insider. 23 January 2015. Archived from the original on 26 January 2015. ↑ Begley, Sarah (27 March 2015). "Emma Watson Named Most 'Outstanding Woman' In the World". Time . Archived from the original on 27 March 2015. Retrieved 27 March 2015. ↑ Sherwell, Philip; Lawler, David (16 April 2015). "Time 100: Emma Watson makes first appearance in the world's most influential list". The Telegraph . Archived from the original on 16 April 2015. Retrieved 16 April 2015. 1 2 "Emma's Book Club – Our Shared Shelf". Goodreads. Archived from the original on 8 July 2016. Retrieved 7 July 2016. ↑ "Emma Watson in Conversation with Gloria Steinem". Goodreads. Archived from the original on 2 February 2017. Retrieved 7 July 2016. ↑ "An Evening with Gloria Steinem and Emma Watson". how to: Academy. Archived from the original on 9 June 2016. Retrieved 7 July 2016. ↑ Andrews, Travis M. (6 March 2017). "'Feminism is not a stick with which to beat other women': Emma Watson tells off critics of revealing photo". The Washington Post . Retrieved 7 March 2017. ↑ "Emma Watson is a spiritual Universalist who believes in a higher power". The Huffington Post. 24 March 2014. Archived from the original on 16 March 2016. Retrieved 15 January 2016. I already, before I did [Noah], had a sense that I was someone that was more spiritual, than specifically religious. I had a sense that I believed in a higher power, but that I was more of a Universalist, I see that there are these unifying tenets between so many religions. ↑ CNWN Collection. "Golden Globes 2018: How to Support the Activists' Causes". Allure. Retrieved 11 January 2018. ↑ "Nominees for 28th Annual Saturn Awards". United Press International. 14 March 2002. Retrieved 7 April 2017. ↑ "Best Debut". Empireonline.co.uk. Archived from the original on 2 February 2003. Retrieved 18 December 2015. ↑ "Emma Watson". Microsoft.com . Retrieved 7 April 2017. ↑ "Prepare to be slimed...as the Nickelodeon Kids' Choice Awards nominees are announced!" (PDF). sydentcent.com.au. 10 August 2006. Archived from the original (PDF) on 12 October 2006. ↑ "Best Actress". Empire . 2008. Archived from the original on 16 September 2011. Retrieved 15 October 2011. ↑ "Twilight Leads the People's Choice Awards Nominations". PopSugar . 10 November 2009. Archived from the original on 7 April 2017. Retrieved 7 April 2017. ↑ "Shining cast of 'My Week with Marilyn' bestowed with 2011 Capri ensemble award". Capri, Hollywood International Film Festival. Capri World. 8 December 2011. Archived from the original on 12 January 2012. Retrieved 15 December 2011. ↑ "Twilight Dominates People's Choice Nominations Once Again". PopSugar . 9 November 2010. Archived from the original on 7 April 2017. Retrieved 7 April 2017. ↑ "Voting underway for 2011 National Movie Awards". UK Cinema Association. 4 April 2011. Retrieved 7 April 2017. ↑ "MTV Movie Awards 2011 nominees". Entertainment Weekly . 3 May 2011. Archived from the original on 7 April 2017. Retrieved 7 April 2017. ↑ "Blake Lively Wins Choice TV Drama Actress The Teen Choice Awards! Here Are More Winners!". Hollywood Life . 7 August 2011. Archived from the original on 9 March 2016. Retrieved 23 May 2016. ↑ "Here's the 2012 Kid's Choice Nominees!". Seventeen Magazine. 17 February 2012. Archived from the original on 3 October 2015. Retrieved 23 May 2016. ↑ "Nominations Announced for the 'People's Choice Awards 2012'". Tvbythenumbers.zap2it.com. 8 November 2011. Archived from the original on 3 January 2016. Retrieved 26 February 2014. 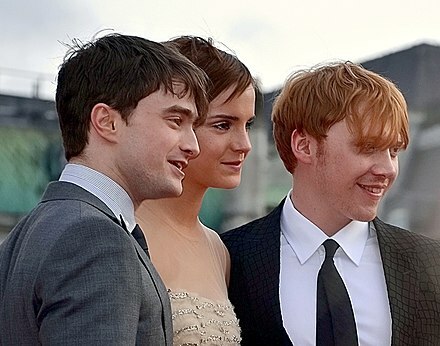 ↑ "Saturn Award Nominations Announced; HUGO and HARRY POTTER Lead with 10 Nominations Each". Collider. 29 February 2012. Archived from the original on 16 April 2015. Retrieved 7 April 2017. ↑ "MTV Movie Awards 2012: The winners in full". Digital Spy . 4 June 2012. Retrieved 7 April 2017. ↑ "Argo Leads San Diego Critics' Awards; Michelle Williams Surprise Winner For Waltz". Indiewire. 23 May 2016. Archived from the original on 13 December 2012. ↑ "Nominees Announced for the 'People's Choice Awards 2013'". Tvbythenumbers.zap2it.com. 15 November 2012. Archived from the original on 2 November 2013. Retrieved 26 February 2014. ↑ "2013 MTV Movie Awards winners list". Entertainment Weekly . 4 April 2013. Archived from the original on 18 January 2017. Retrieved 7 April 2017. ↑ "Complete list of Teen Choice 2013 Awards winners". Los Angeles Times. 11 August 2013. Archived from the original on 22 April 2014. ↑ "People's Choice Awards: Fan Favorites in Movies, Music & TV". PeoplesChoice.com. Archived from the original on 30 November 2009. Retrieved 23 January 2014. ↑ "Teen Choice Awards Nominees For 2014 Announced". The Huffington Post . 18 June 2014. Archived from the original on 3 March 2016. Retrieved 7 April 2017. ↑ "Robert Downey, Jr. & Judi Dench Among BAFTA LA Britannia Awards Honorees". Deadline Hollywood . 18 September 2014. Archived from the original on 19 September 2014. ↑ Knapp, JD (7 May 2017). "2017 MTV Movie and TV Awards: Complete Winners List". Variety. Archived from the original on 8 May 2017. Retrieved 8 May 2017. ↑ Ramos, Dino-Ray (13 August 2017). "Teen Choice Awards 2017 Winners: 'Wonder Woman', 'Beauty And The Beast', 'Riverdale' Among Honorees". Deadline Hollywood. enske Business Media, LLC. Retrieved 14 August 2017. ↑ Hooton, Christopher (22 January 2018). "2018 Razzie awards: Emma Watson and Jennifer Lawrence among nominees for disservices to film". The Independent . Retrieved 5 February 2018. ↑ Ruby, Jennifer (19 January 2018). "Empire Film Awards 2018: The Last Jedi leads the pack with nine nominations including Best Actress for Daisy Ridley". London Evening Standard . Retrieved 29 January 2018. ↑ Pedersen, Erik (26 February 2018). "Nickelodeon Unveils 2018 Kids' Choice Awards Nominations". Deadline Hollywood . Retrieved 3 March 2018. ↑ McNary, Dave (15 March 2018). "'Black Panther,' 'Walking Dead' Rule Saturn Awards Nominations". Variety . Retrieved 16 March 2018. ↑ USA TODAY Life staff (24 September 2018). "People's Choice Awards 2018: The nominees". USA Today. Retrieved 6 October 2018.